With this film, David Robert Mitchell has basically solidified his position as the world's new Richard Kelly. IT FOLLOWS was his DONNIE DARKO, and THIS is his SOUTHLAND TALES. Southland Tales is the ONLY movie that I find this truly comparable to. First, it's strengths: it is astronomically ambitious, unpredictable, and it will go WAY out of it's way to try to be weird. You have to give anyone who is willing to go THAT FAR out on a limb a little bit of credit. But, aside from that, the casting of a few extremely good looking people, and the desire you'll probably feel to continue observing this 2 hour and 20 minute freakshow just to see if the train wreck can get any uglier, the positives end there. Now, let's just talk about the most painful parts: Garfield's character is impossible to take seriously the majority of the time. His portrayal of a smelly (people bring up how horrible he smells literally every 5 minutes throughout the film) timid weirdo is awkward in the wrong way - reminds me of Bradley Cooper in Silver Linings Playbook - you're trying to be a weirdo but it's not working - I see acting, I see trying. Then, he transforms into the Terminator in some really out-of-place sequences that would be really cool if they didn't make such little sense in their placement. Second, this is a movie about Los Angeles that feels like it was made by someone who only knows as much as tourists know about Los Angeles. The locations are all the most cliche L.A. staples, which serve their purpose, but the majority of the characters feel like ignorant caricatures of what outsiders think L.A. people are like: yoga hippies, music producers, prostitutes, but all depthless interpretations with no inspiration - there is one specific "L.A. party" sequence on a downtown rooftop full of bland L.A. actors trying to portray eccentric L.A. people and it's so off base it feels like a rejected Target commercial. It's clear that this movie wants to be Mulholland Drive, but it lacks the conceptual focus, the effective dreamlike surrealism, and the palpable creativity that make that film so masterful. The "homeless king" clearly wishes he was "the mysterious cowboy", but he's not - his crown looks way too cheap. 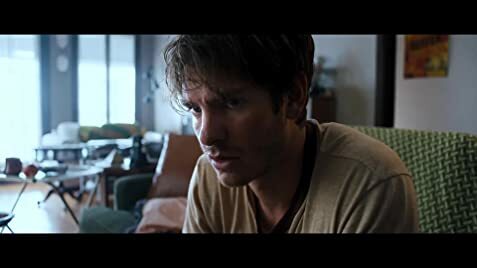 Under The Silver Lake is full of "totally random" characters, scenarios, and cryptic "clues" that eventually tie into EACH OTHER, but still leave you feeling like they all served no plausible purpose in the end, like connecting a bunch of effects pedals with coupler cables but then having no batteries or AC adapter to power them up with. The film takes place in 2011. The TV news segments shown in the film refer to the date. Bikini Top Hat Girl: Welcome to Purgatory. Sam: Good to be here. When Sam drinks the tea, we see it to the right of him when the camera faces him. But, in the cut to the next shot behind him, he picks up the tea from his left.